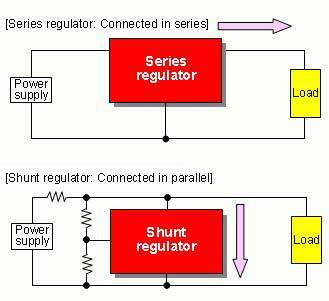 Shunt voltage regulator has good voltage regulation even at high load currents. Series voltage regulator has not so good voltage regulation at high load currents. In the shunt voltage regulator the output DC voltage is constant. 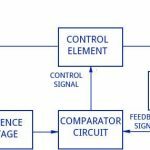 In the series voltage regulator the output DC voltages is not constant. Shunt voltage regulator is connected in shunt with the load. Series voltages regulator is connected in series with the load. 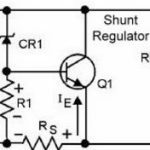 Shunt voltages regulator has good efficiency for low load current. 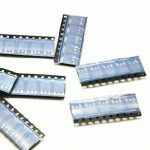 It has good efficiency for higher load currents. It is appropriate for light loads. It is appropriate for heavy loads. 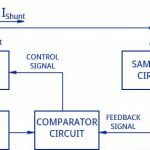 Shunt voltage regulator has poor voltage is constant. Series voltages regulator has better voltage regulation. The control element has to bear the load voltage across it. So, it is a high voltage low current device. The control element has to carry the load current. So, it is a high current low voltage device.